Stamping and CNC machining precision. Technic: CNC, lathe, milling, drilling, turning, grinding, polishing. The precision can reach 0. 002mm. We can manufacture hydraulic tools and hydraulic cylinder and non- Standard hydraulic tools and supply precision shaft, gear, threaded adapter. Precision Metals Works is committed to understand and exceed the expectations of our customers.Our Quality Assurance Department is fully equipped with all appropriate calibrated gauging and measuring equipment. All Inspection equipment is externally calibrated by independent specialists. Every stage of development and production is carefully monitored to meet the most demanding quality control standards. We specialize in manufacturing precision turned CNC Precision Turned Components that finds application in plastic, engineering, automobile, and electronic industry. Precision Metal Works - India CNC machining precision parts supplier produce the CNC machining precision parts for various Pharmaceutical machinery, Pneumatic & Hydraulic From prototype to manufacture, fabrication to installation, our in-house facilities provide all the elements required to suit your demands, with a complete project management service to match.Whatever the material or idea you have, our CNC machining or milling facilities will cut and shape it according to both your needs and our knowledge of capabilities.we will also advise you as to the optimum choice of material for your task. We undertake time sensitive machined metal and plastic parts. We pride ourselves on delivering parts on-time. Since our Motto is "Under Promise, Over Deliver", you will probably receive your parts earlier than our committed ship date. Rapid Machining’s focus is on prismatic, rectilinear machined prototypes and time sensitive parts (in essence, 2.5 axis machining). Complex surfaces are not a fit. By default we hold +/-.005" and are able to hit +/- .001” tolerances and tighter upon request. In general, we prefer part size to be no larger than a 40” x16” XY footprint. Tool making and/ or surface grinding requirements are not a fit. 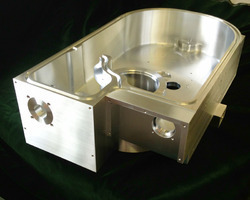 Rapid Machining concentrates on turned machined prototypes with a maximum diameter of 12 inches. Part length maximum is 36 inches. Knurled surfaces to your specifications. Threading (internal and external), drilling and tapping are standard. A particular specialty is captivated O-Ring grooves. Our CNC Lathes/CNC Mills are proficient in manufacture your OEM parts and all grades of material including carbon steel, cobalt, aluminum, bronze, titanium, and duplex materials with contour turning, form turning, taper turning, or straight turning. 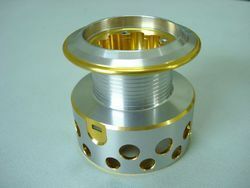 Our CNC Lathe machines are capable of working on parts. The CNC Mill. Furthermore, we also work with nylon, delrin, peak plastic, and PVC and fully include OEM parts, heat treating, UT, mag. particles, and plating tolerance as tight as .0004. CNC Precision Milling And Turned Parts: We manufacturer and supply precision turned components as per customer drawings or specific samples on CNC Turning Centers. Cost Reduction: Cost reduction options include reducing the amount of material removed, limiting complexity, avoiding intricate features and making shapes that are easy to hold. Close Tolerance CNC Machining to .0005"
Quality Control System: 100% inspection before shipment. 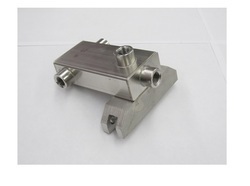 Our company is engaged in manufacturing various CNC Milled Parts. 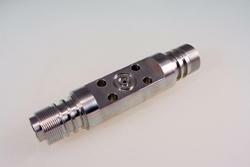 We manufacture CNC Milled Parts for these customers with very high accuracy.